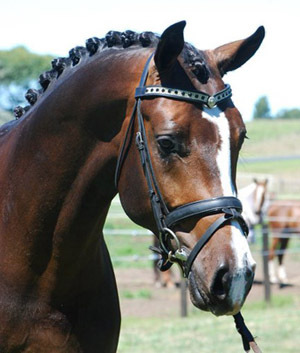 100% GERMAN BLOODLINES, OF INTERNATIONAL DRESSAGE SENSATIONS ROHDIAMANT AND STEDINGER. OLDENBURG/HANOVARIAN. After years of searching for another Stallion or Colt to match and compliment our beloved Donnerubin’s bloodlines, temperament, and movement we have finally found him! 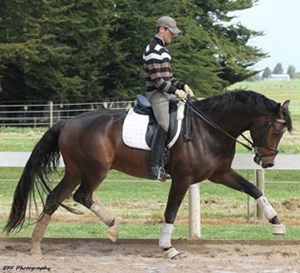 Rohdinger’s sire is the dressage sensation, Rohdiamant, who is undoubtedly the most outstanding of the Rubinstein Sons. Twice winning the Bundeschampion, World-Cup Grand Prix Freestyles and International Grand Prix, and now also the sire of champions on the international stage. Rohdiamant in 2008 joined his Sire Rubinstein in the list of the world’s top 10 dressage sires. His progeny include; Real Diamond who led the German FN Dressage Breeding rankings 2010 and Edward Gal’s two new GP Dressage superstar Stallions, Voice (De Niro/Rohdiamant) and Blue Hors Romanov (Rohdiamant/Grundstein/Akzent II). Rohdinger was imported in utero with his Verband Premium dam, who is by the sensational Sandro Hit son Stedinger. Stedinger’s legend is just beginning, but started with becoming Champion Stallion at the Oldenburg Licensing in 2002. His progeny reach top prices at Auction, as well as winning multi championships themselves. Rohdinger’s Dam is in turn by Ramiro Z, a very successful show-jumping stallion, whose bloodlines can be seen in horses competing internationally in dressage.